This is a luxury one bedroom studio apartment close to Boscombe Spa Beach. The studio enters into hallway lit with a large window and accesses an open plan kitchen, bedroom and kitchen through one doorway and a separate self-contained bathroom through another doorway. There is a balcony accessed through a door off of the living area. The kitchen is fully equipped including oven, hob, microwave, washing machine, fridge, freezer, kettle and toaster. The bed folds up into a wardrobe to create a really spacious area by day/evening time, and there is plenty of other wardrobe and drawer storage space. The bathroom is fitted with an electric shower over the bath, a vanity unit and toilet. The balcony faces the sea and is simply a tranquil area to sit with a drink and listen to the waves break to shore. Boscombe Beach and Chine Gardens are both within less than a five minute walk, and there is a selection of restaurants and bars within a similar reach. The local pedestrianised shopping area which includes three supermarkets and a selection of local and national chain type shops is approximately a 10 mins walk away. Bournemouth town centre can be reached along the promenade or clifftop route in about 30 minutes. Bus stops are a few minutes walk away giving you access to Bournemouth, Christchurch, Sandbanks, Poole and Swanage, and the combined coach, bus and railway station along with a taxi rank is approximately one mile away. Boscombe Spa Village is a quiet residential neighborhood popular with surfers and beach lovers. It is located to the east of Bournemouth and is one of the most popular parts of Bournemouth with an urban village feel, yet benefits from a eclectic range of architectural building styles. Boscombe has a good selection of independent stores, cafes and restaurants and has a twice weekly outdoor market. One of the best attractions of the area is the seven miles of golden sands from Sandbanks to Hengistbury Head. Boscombe Beach with it's own pier is in the middle section of this stretch and attracts a lot of visitors, yet there are also quiet sections of the beach a short stroll along the promenade. The Bournemouth Air Festival is a four day event held between Bournemouth and Boscombe Pier every year and for 2018 is scheduled from the 30th August until the 2nd September. It's a truly amazing event packed full with day and night time displays, fair rides, stalls and other thrilling events and activities. The studio balcony offers a great location to capture a lot of the air displays. It's perfect for chilling with a nice glass of wine and lunch for example. Our place is close to Boscombe Beach, the pier and Chine Gardens. It has a choice of good restaurants, bars, local shops and the town centre. 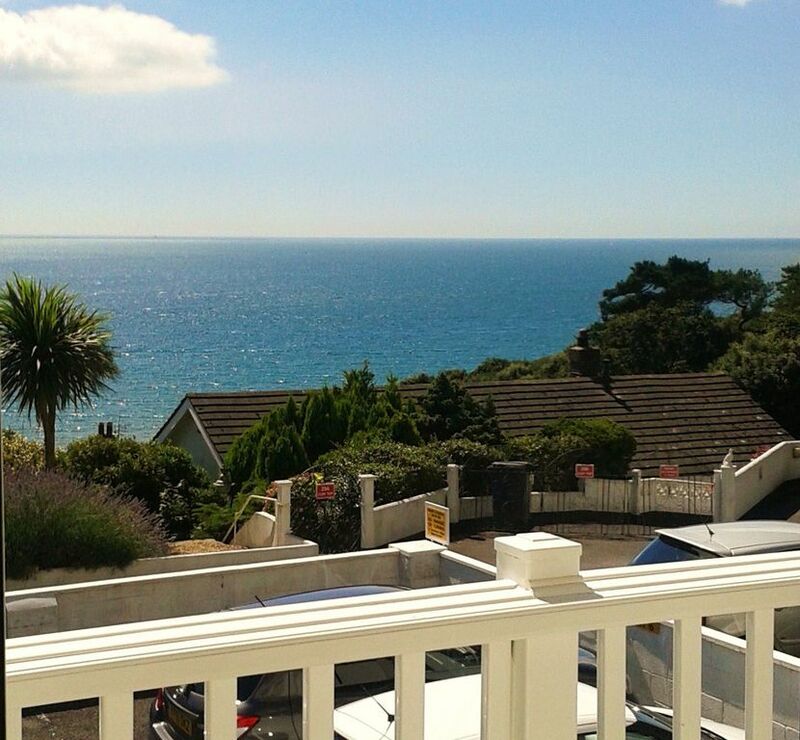 You’ll love our place because of it is quietly located with a private balcony looking out to sea. The interior is spacious and with a modern interior design, that makes great use of space and storage. You should also find your stay to be very calming and relaxing. It‘s a great place for couples or singles. Well situated for beach between centre of town and Christchurch. All we needed to make ourselves at home. Owner went the extra mile to make us comfortable by bringing coffee pot. Overall we were very happy with our stay. We had a wonderful stay in a very comfortable, cosy, home from home. The owner was extremely helpful on our arrival, helping us to find a parking space and unload our luggage. The apartment was spotlessly clean, bright and airy. We had a short walk to the beach, and the shops were only a 7 minuet walk away. There are plenty of bars, cafes and restaurants about and the beautiful clean beach goes on for miles. Stayed 5 nights in this compact well decorated appartment. Bed was comfortable and the kitchen was well equiped. Kevin, the owner is extremely friendly and helpful, with tips about the local area and places to eat which were very useful. Supermarkets are in walking distance as is the very lovely sandy beach. Had a super 5 nights here and can highly recomend a stay if you are visiting Boscombe/Bournemouth. Thank you for your very kind review. I'm glad you enjoyed yourselves and had a great time whilst staying here. Property was very clean and had all the facilities you could need. Property was well situated, Ideal location for exploring Boscombe, Bournemouth and surrounding area. Enjoyed my visit and Kevin was very helpful in moving my luggage from ground floor to studio flat with balcony (thankyou!! ), for latter part of my stay. Flat was very nice & well furnished inside and good view of sea from balcony. Great location from which to visit local plus surrounding area. Can recommend visiting The Tank Museum at Bovington and Lulworth Cove/Durdle Door (fine weather permitting). Boscombe & Bournemouth both have plenty to offer, pubs/restaurants plus also not forgetting the Chines (particularly Boscombe Chine Gardens, which was very well presented & with local volunteers available - namely Dorset Devils). Can also recommend long walk from Boscombe East Cliff to Hengistbury Head, with fantastic views overlooking Christchurch Bay and towards IOW. All together a great time had, and hope to be back again at some time. Lovely flat ,beautifully clean, and comfortable.lKevin,the owner, was very helpful. There was tea,coffee, milk ,sugar and sweeteners waiting for us,so no rushing to the shops to get a things for a cuppa. - Boscombe's pedestrian shopping area is approximately 10 minutes walk from the Studio. Here you will find the essentials at Sainsbury's, Aldi and Lidl Supermarkets. Its' also known for its outdoor market that’s open on Thursdays and Saturdays. There’s also a wide range of shops to explore under cover in the Sovereign Centre and Victorian Royal Arcade. The Royal Arcade is definitely worth a look; a beautiful throwback to the Victorian era with a fascinating and varied range of independent shops including a record shop, galleries and art supplies, clothes, tarot reading and a café with outdoor seating.